The Ruins of the Ringling Ritz Carlton, abandoned after the Florida Real Estate Crash of 1925. The first Florida Land Boom of the 1920’s was the nation’s first real-estate bubble: a period of wild speculation, easy credit, and out-of-control building, schemes and scams, and rapidly rising property values (sound familiar?). The bubble burst in 1925, when Forbes Magazine proclaimed that the value of Florida real-estate were based “solely on the expectation of finding a buyer, and not on any actual value!” (again, sound familiar?). Furthermore, Florida’s railways couldn’t keep up with the massive movement of building materials into South Florida, and the state’s three railroad companies called an embargo on all but essential freight, halting many construction projects. Then, in January of 1926, The Prinz Valdemar, a steel-hulled schooner that had been converted into a floating luxury hotel, capsized in Miami Harbor, blocking shipping lanes. The combination of the rail embargo, the negative press, and the Prinz Valdemar disaster burst the bubble, crashing property values and turning half-built developments into abandoned ghost towns. It seems that, around this time, it became fashionable for people to go to Florida to build something crazy. This never really fell out of fashion, I feel, and the result has been a collection of some of the most unusual structures you can imagine. These things range from the peaceful gifts to the world, to garish monuments to ego, to mysterious personal passion projects. Edward Bok’s story is about as wholesome as you get- Born in the Netherlands, he was brought to the U.S. by his parents when he was six. He worked his way up as a writer and editor to become managing editor of Ladies Home Journal- making it the first magazine ever to have a circulation of over one million. While vacationing in Lake Wales, he hiked up a hill to watch the sunset. He was so taken with the view from what he called ‘Iron Mountain’ (not really a mountain), that he bought it and hired Frederick Law Olmstead Jr. (who landscaped most of Washington DC’s most famous monuments, and the son of the designer of Central Park) to turn the hill into a garden sanctuary. Olmstead laid irrigation pipes and brought in thousands of truck-loads in more fertile soil to create a garden of winding paths and reflecting pools. Then Bok hired architect Milton Medary to build a 200-foot pink marble Gothic Revival/Art Deco tower at the highest point of the hill. The tower is decorated with images from Genesis- Adam and Eve in the Garden of Eden, and The Serpent on a sundial on the West side. 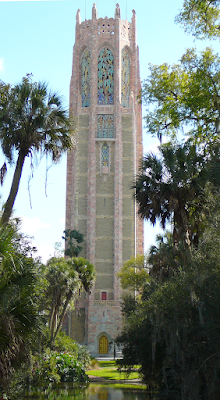 The Tower isn’t just an ornate centerpiece of the garden, it is, in fact, a massive musical instrument, with 23 tuned bells that can be played with a keyboard located in the tower’s base. Bok meant his tower and gardens as a gift to the American people who had welcomed him when he was an immigrant child and allowed him to advance in life. It’s a great place and, yes, it is about the most pleasant wholesome spot in Florida. Since we live in a land of contrasts, I’m going to go all the way to the other end of the spectrum now. In 2004, David Siegal, founder of the Westgate Resorts Time-Share company, began construction on what was meant to be the largest private home in the United States. Modeled after the Palace at Versailles, the home is in the Lake Butler community of Windermere, Florida- and as of October 2017, construction still wasn’t finished. Construction of the 90,000 square foot McMansion from Hell stalled out when Siegal’s company lost millions following the 2008 real-estate crash, and the unfinished monstrosity was listed for sale for 65-million dollars. Nobody bought it, and when the time-share business recovered, construction continued. The house has 11 kitchens, 32 bathrooms, 14 bedrooms, a bowling alley, a move theatre, and any other kind of preposterous thing you can think of. And it has doors and windows made of the some of the last remaining wood from a nearly-extinct variety of Brazilian mahogany. The house has been described as ‘a monument to bad taste,’ ‘wretched excess,’ and ‘a crime against nature.’ The creative force behind the house, Jackie Siegal, has been the subject of documentaries and reality TV shows, and was recently rumored to be considering running for Governor of Florida. 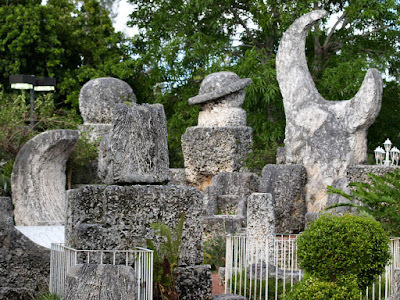 The Coral Castle, in Homestead, is a series of structures and sculptures made of massive slabs of compressed coral stone, built by a single 5-foot-tall, 100-pound, man who suffered from Tuberculosis, and who used no heavy equipment. Leedskalnin worked under cover of darkness to avoid the intense South Florida Heat, and he claimed to know the secrets of the builders of Stonehenge and The Pyramids of Egypt. He said his knowledge of leverage and magnetism allowed him to move six-ton stones with only the simplest tools and build one of the world’s strangest monuments to a broken heart. Ed worked on the castle until his death in 1951. 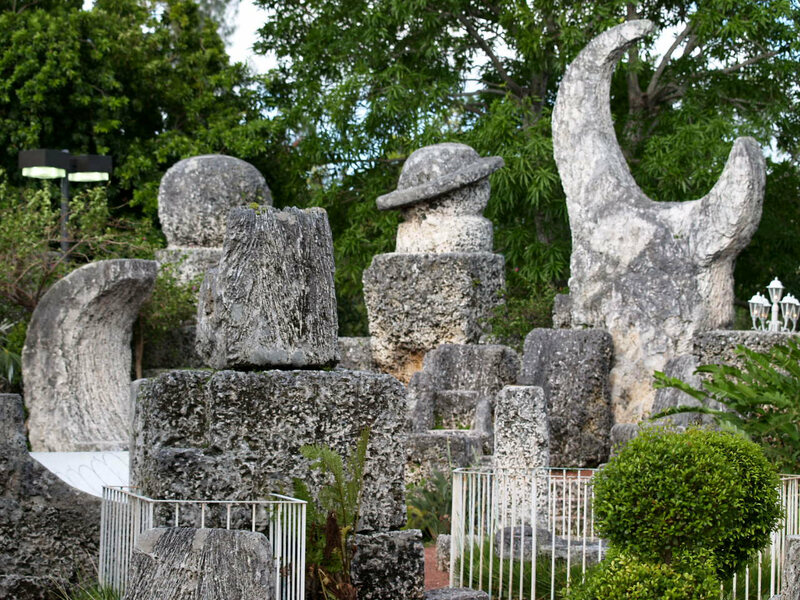 Ed Leedskalnin began giving tours of his Coral Castle in the 1940’s, and by the time of his death, it had become one of Florida’s strangest roadside attractions. Florida, as we know it, wouldn’t exist without Henry Plant- the railroad magnate built an empire by buying up bankrupt Southern railroad companies after the Civil War, in the 1880’s he expanded his rail system into Florida, and added steam-ship lines and a series of hotels. 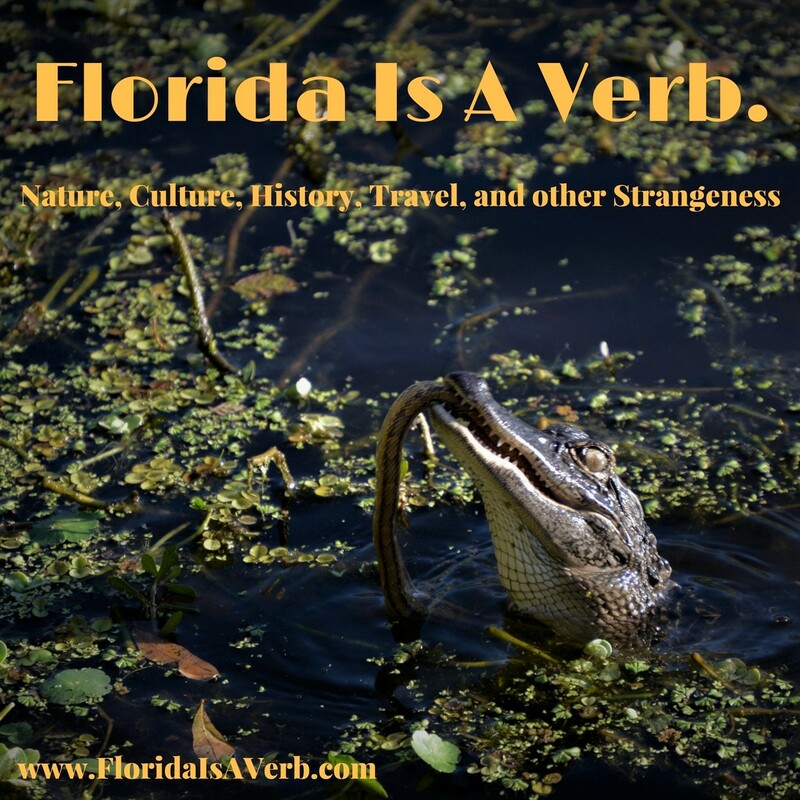 Plant basically invented Florida tourism by offering single-ticket packages for travelers from the North looking to escape the harsh winters. A tourist from New York could pay one price for a trip on a Plant steamship that would connect them to a Plant railroad that would take them to a Plant hotel. Plant centered his empire in Tampa, then a tiny seaport town on the Gulf Coast. 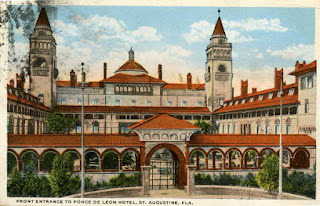 Simultaneously, Henry Flagler, Plant’s sometimes-competitor, sometimes-collaborator, was building a similar empire of railways and hotels on the Atlantic coast of Florida. 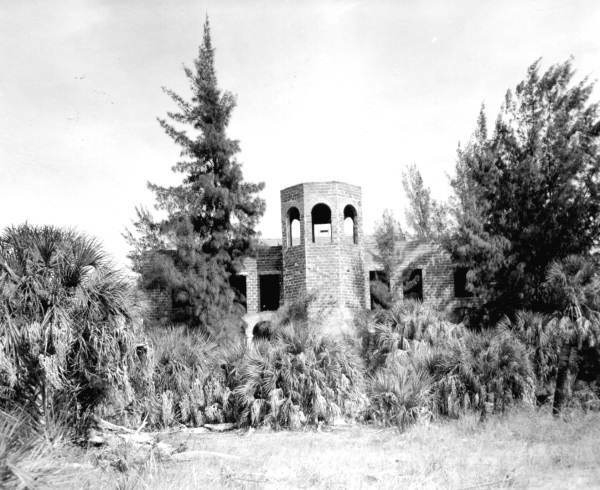 It was this rivalry that led to the creation of two of the most bizarre and opulent structures in Florida’s history. 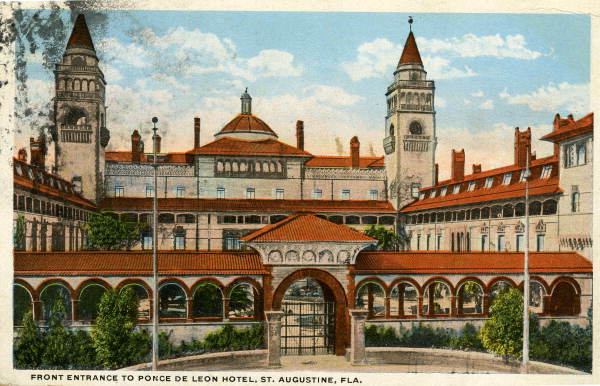 Flagler began building the Hotel Ponce De Leon in 1885, a massive lavish structure made of poured concrete and coquina in a Spanish Renaissance style-- with its own DC generators designed and installed by Thomas Edison, interior designs and stained glass by Louis Comfort Tiffany, and murals by George W. Maynard. Not to be outdone, Henry Plant began building the Tampa Bay Hotel soon after Flagler’s hotel opened. 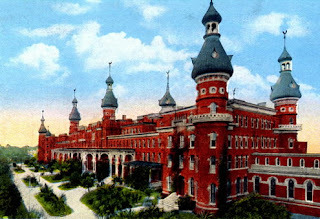 The Tampa Bay Hotel featured a fantastical combination of architectural styles, a sort of American impression of middle-eastern design with steel onion-dome minarets topped with crescent moon ornaments. At a cost of 3-million dollars (75-million in today’s currency), it was the most expensive hotel ever built. Plant filled it with antiques from Europe and Asia, and built a bowling alley, a race-track, a casino, a heated swimming pool, a golf course, and a theater on the hotel grounds. Guests were ferried around the grounds of the hotel (and the frontier city of Tampa) in covered rickshaws and were waited on hand and foot by a team of butlers. Both hotels catered to the wealthiest people of the age, who would spend months at a time at the lavish resorts. Today, both are part of college campuses, and have been restored to some of their Gilded age opulence. 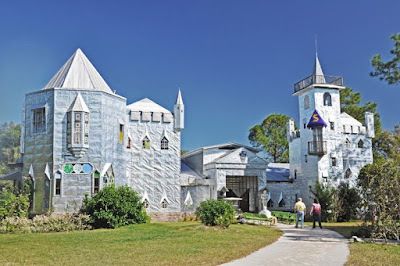 Howard Solomon called himself the DaVinci of Debris, a metal-worker and artist, he used cast-off materials to create numerous sculptures and structures while living on a 40-acres plot of swampland in Ona, Florida. 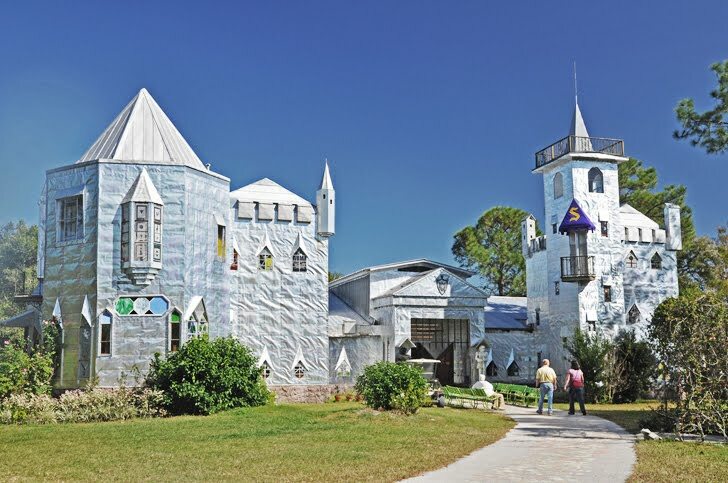 In the 1970’s he began constructing his own fairy-tale castle out of aluminum printing plates that were being thrown out by a local newspaper. Solomon kept adding to the castle, filling it with sculptures and stained glass until his death in 2016 (Note: I never got to go to Solomon’s Castle before his death, but I’ve been told that Howard Solomon’s personal tour was filled with hilarious and ridiculous puns). Today, the shining metal castle in the middle of nowhere operates as a tourist attraction, art gallery, and bed and breakfast. It also features a restaurant that operates out of a replica of a 16th-century Spanish galleon that Solomon built. 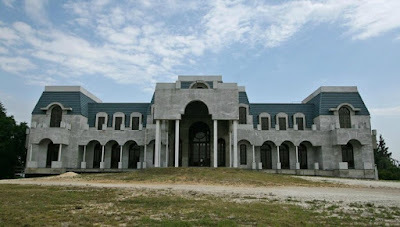 To me, the most bizarre building in Florida is also the oldest. In fact, it’s the oldest non-indigenous structure in the United States, and was actually built more than three hundred years before Columbus set sail. The Monastery of Our Lady Queen Of The Angels was built in Segovia Spain between 1133 and 1141, so how did it get to North Miami Beach? At the height of his wealth and power in the 1920’s William Randolph Hearst would frequently tour Europe to add to his prodigious collection of antiquities. 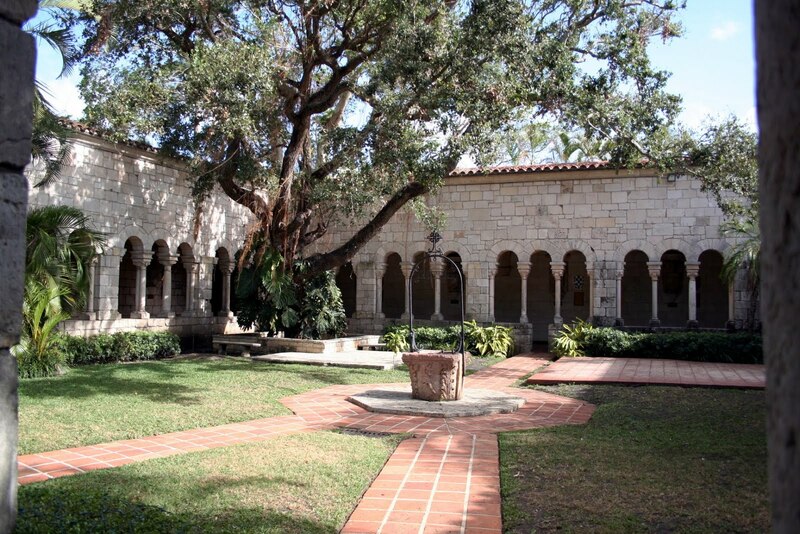 In 1925 while touring Spain, he visited the Cistercian Monastery, and bought the cloisters. The medieval building was disassembled stone-by-stone and packed in over 11,000 crates to be shipped to the U.S. The crates were meticulously labeled so that the building could be easily reassembled, but an outbreak of hoof-in-mouth disease caused the shipment to be seized at the border, the straw used as packing material was burned over fear of the disease, and the pieces of the building were re-packed at random. Financial problems prevented Hearst from carrying out his original plan of reassembling the cloisters at his San Simeon Castle- and the boxed-up monastery sat in a Brooklyn warehouse until after his death. In 1952, Raymond Moss and William Edgerton bought the pieces and began reassembling them on the site of a plant nursery in North Miami Beach. There is, of course, no way of knowing if they were reassembled correctly, and supposedly there were pieces left over, like in any such project. Moss and Edgerton also added other Spanish antiquities and marketed it as a tourist attraction- The Ancient Spanish Monastery. In the 60’s he property was bought by the local Episcopal Diocese, who still operate it today.